Bill Peterson pulled FSU up by the chin strap from a wanna-be program to a college football powerhouse. He hired assistants who would go on to coach Super Bowl teams. And he made the Noles' offense the most exciting of its time. His teams were the first to beat the Gators. First to win a major bowl game. First to finish in the Top 25 (#11 in 1964). 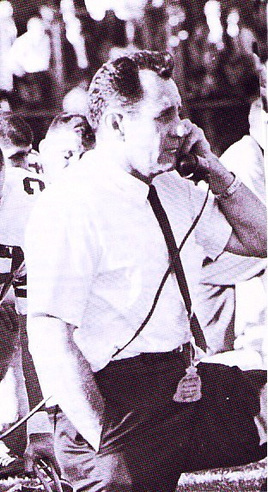 "Coach Pete" even planted the seeds of a future dynasty when he added a young Bobby Bowden to his staff. In 1993, Peterson lost his battle with cancer. Fortunately, he left a namesake who was there for FSU's coming out party. Listen as Bill Peterson, Jr. — today an assistant coach at Shorter College in Georgia — recalls how his Dad put Florida State on the college football map. And almost beat "The Bear." Former Noles Claudius Osei and Xavier Beitia spent their Spring touring the continent. But instead of checking out castles, they were playing in the NFL Europe. Osei was the starting Free Safety for the Hamburg Sea Devils, which turned around a winless season by taking their last three games. Claudius finished with 33 tackles, including six on special teams. Former teammate Beitia was the leading scorer for the Berlin Thunder. The X-Man had 48 total points,hitting on nine of thirteen FG attempts (with 47 yds. his longest) and 21 of 21 PATs. Next up for Beitia: attempting to win the Bucs PK job during pre-season camp.